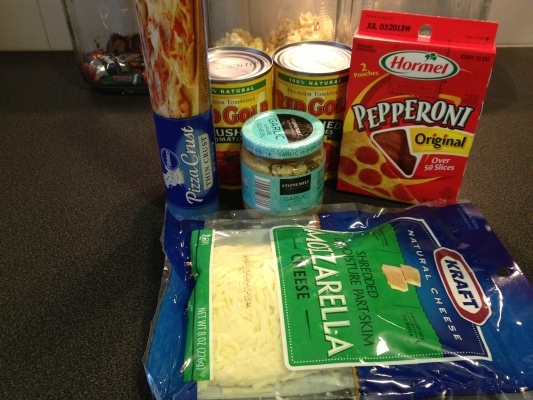 I decided it might be fun to make our own pizza. Our normal ordering of pizza delivery has gotten really expensive. 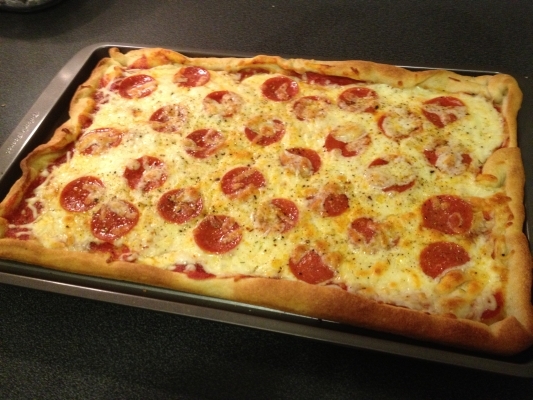 So, I picked up some of the Pillsbury refrigerated pizza dough to give it a try. It actually is very good! We may have to try making our own dough soon, but this has set the bar pretty high, so we’ll have to see how that works out. It was great pizza for $3.32. It was actually fun for everyone to help and now everyone wants to try their hand at creating their own pizza masterpiece. So we will probably be doing this every Friday for a while. So check back each Friday and see what new creations we come up with. 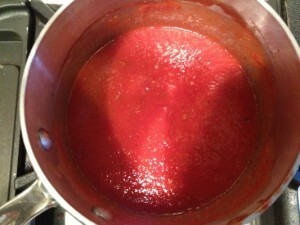 We make the pizza sauce by placing all the ingredients into the food processor and pureeing it together. Transfer the mixture to a saucepan and simmer for 30-45 minutes over medium heat or until you get the desired thickness. There is enough sauce for several pizzas (depending on how much you use) so refrigerate or freeze the remaining sauce depending how soon you will be using it. This sauce is a little on the sweet side (kind of like LaRosa’s). Follow the instructions and spread the crust out onto a 10×15 non-stick cookie sheet. The instructions say to grease it first, but I was using one of my new Bakers Secret pans we got SUPER CHEAP at Kroger. So, I didn’t and it turned out fine. 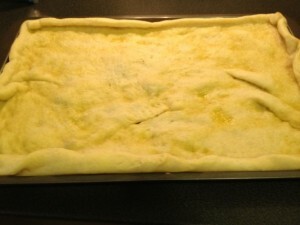 You need to pre-bake the crust at 400 for about 10 minutes before adding toppings. This is because the oven temps in a home oven don’t get as hot as a pizza oven and the dough would not cook properly. After you finish the pre-bake, thinly spread the sauce around to cover the bottom. Add cheese making sure to get it all the way to the lip of the crust. Add the peperoni making sure to evenly cover. Then sprinkle a little cheese on top of the pepperoni to keep it from burning. Sprinkle with a little oregano and basic and back into the oven for about another 10 minutes or until it looks done. As I said it really turned out well and was gone FAST! I guess I better plan on making a few every Friday. We make the pizza sauce by placing all the ingredients prior to the Pizza Crust into the food processor and pureeing it together. Transfer the mixture to a saucepan and simmer for 30-45 minutes over medium heat or until you get the desired thickness. This sauce is a little on the sweet side (kind of like LaRosa’s). Follow the instructions and spread the crust out onto a 10×15 non-stick cookie sheet. The instructions say to grease it first, but I was using one of my new Bakers Secret so, I didn’t and it turned out fine. You need to pre-bake the crust at 400 for about 10 minutes before adding toppings. This is because the oven temps in a home oven don’t get as hot as a pizza oven and the dough would not cook properly. After you finish the pre-bake, thinly spread the sauce around to cover the bottom. Add cheese making sure to get it all the way to the lip of the crust. 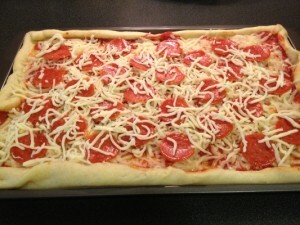 Add the pepperoni making sure to evenly cover. 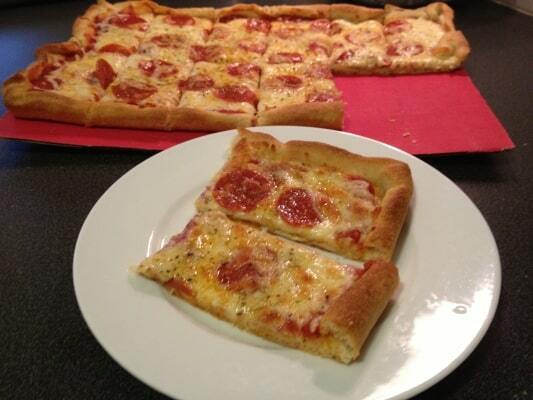 Then sprinkle a little cheese on top of the pepperoni to keep it from burning. Sprinkle with a little oregano and basil and back into the oven for about another 10 minutes or until it looks done.